4/10 – Ypsilanti, MI @ Ziggys; info. 4/11 – Detroit, MI @ Tangent Gallery; info. 4/12 – Pittsburgh, PA @ The Fabulous Pinto Museum; info. 4/13 – Kalamazoo, MI @ Boiling Point; info. 4/14 – Chicago, IL @ Roaring City Festival; info. 4/16 – Kansas City, MO @ MiniBar; info. 4/17 – Oklahoma City, OK @ The Flea; info. 4/19 – Huntsville, AL @ Flying Monkey; info. 4/20 – Greensboro, NC @ Club Orion; info. 4/24 – Asheville, NC @ Odditorium; info. 4/26 – Washington, DC @ The Crucible; info. 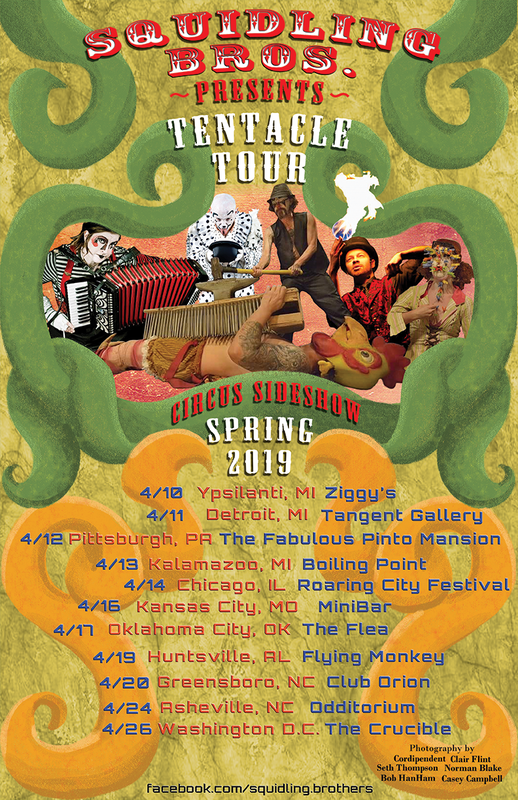 The Squidling Brothers Circus Sideshow is a collective of sideshow, freakshow, cabaret performers, and musicians based out of Philadelphia, PA.